In April of this year, U.S. show jumper McLain Ward and his Olympic mount Sapphire were top contenders for a World Cup title. The pair had made it to the Finals in Switzerland and were in second after the first round. During routine testing, the FEI veterinarian found hypersensitivity in Sapphire’s left foreleg, but declared her fit to compete. Ward and Sapphire completed the second round and placed second again, putting them in first place overall. Sapphire was re-examined after the second round using thermography and clinical examination. 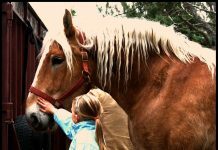 The thermography tests showed nothing abnormal, but the clinical examination, which involves tapping the horse’s leg repeatedly to check for a pain response, showed the mare to be hypersensitive, according to vets. This time, they declared her unfit to continue in the competition, eliminating her from further competition and retroactively disqualifying her from the second round. Sapphire was also drug tested, and the results from those tests came back clean. At that time, the FEI veterinarian clarified that no one, Ward included, was being accused of wrongdoing. 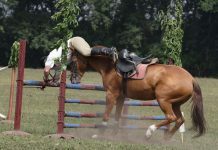 The tests aim to determine whether the horse is in pain, even if that pain comes from an unintended source such as an insect bite or a stable accident, the FEI must eliminate a horse in pain from continuing to compete. However, controversy erupted after the ruling, with Ward and others stating that the test did not definitively show that Sapphire was experiencing any pain. U.S. team veterinarian Timothy Ober stood behind Ward after the incident. “In my opinion, this opinion was incorrect, subjective and unsubstantiated. Having known Sapphire for several years, the horse is excellent, in normal form and is fit to compete,” he stated. Other riders came forward in support of Ward, and U.S. show jumping chef d’equipe, George Morris, called the FEI’s ruling, “disgusting,” among other things. This month, the FEI released a statement regarding the April ruling reversing the decision to eliminate Sapphire from the second round, but sustaining the decision to disqualify her from the remainder of competition. After a full investigation into the facts surrounding the disqualification of Sapphire (McLain Ward) at the FEI World Cup Final in Geneva, the FEI has determined that the horse was incorrectly eliminated from the second round on 16 April 2010, however, Sapphire’s disqualification from the final round of the World Cup remains in place. McLain Ward will immediately be awarded all ranking points and prize money related to his second place finish in the second round of the FEI World Cup Final. This will not affect ranking points and prize money awarded to other riders in the competition. As a result of this investigation, the FEI has also decided to issue mandatory guidelines to be applied by the Veterinary Commissions appointed for FEI Events in order to strengthen the hypersensitivity protocol that was applied in Geneva. These guidelines will be communicated to all National Federations prior to the CHIO in Aachen (GER). 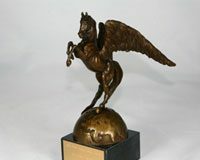 The USEF, McLain Ward and Tim Ober have stated that they do not agree with the FEI on the question of whether Sapphire displayed a level of sensitivity that justified her disqualification from the third round of the World Cup and also disagree with the process followed however, in the best interest of the sport, they have dropped their legal case against the FEI and will not challenge this disqualification. Ward is no stranger to controversy. In 1999, he served a suspension after stewards reported finding plastic chips in his horse’s boots. The plastic chips would cause pain should the horse hit a rail. 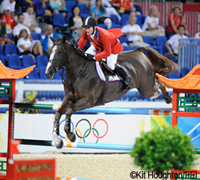 Ward still denies that charge and has competed without incident since then, becoming on of America’s top show jumpers. I support the decision. I also support the horse protection bill which protects horses from the pain of unethical training methods. I think they made the right decision. A horse shouldn’t continue competing if there’s a risk. It’s just one of those things a competitor has to live with. I am glad that they awarded him his rightful second place finish though. On another note, I don’t have respect for any rider that would intentionally put plastic chips to cause pain. How can that be contested? Either they were there or they weren’t. Which is it? They made a correct statement, that the heat in her leg could grow to something larger, and they don’t want an amazing jumper like her to hurt herself more and end up having to be out of competing for a while. That would crush EVERYONE. They should’ve let Ward have his own opinon about competing her with her leg, and if they could wear boots, they should be allowed to wrap her up or put protective boots on.